At the time of her commissioning on 9 April 1941, the NORTH CAROLINA was considered the world’s greatest sea weapon. During World War II, she participated in every major naval offensive in the Pacific area of operations and earned 15 battle stars. After serving as a training vessel for midshipmen, NORTH CAROLINA was decommissioned 27 June 1947. 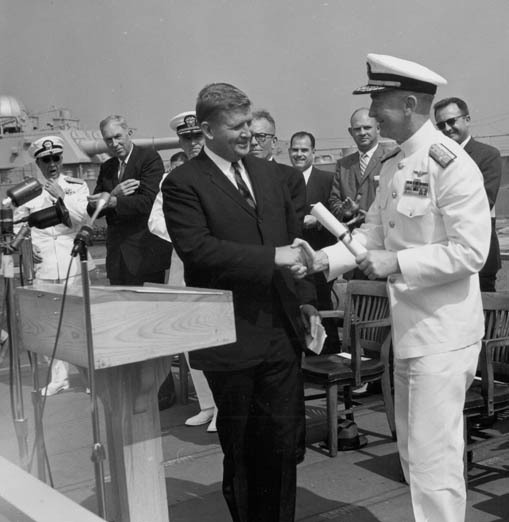 In 1958 the Navy decided that it did not need the NORTH CAROLINA in the fleet. The ship was going to be sold and the new owners could melt down the ship to make other things like razors and cars. 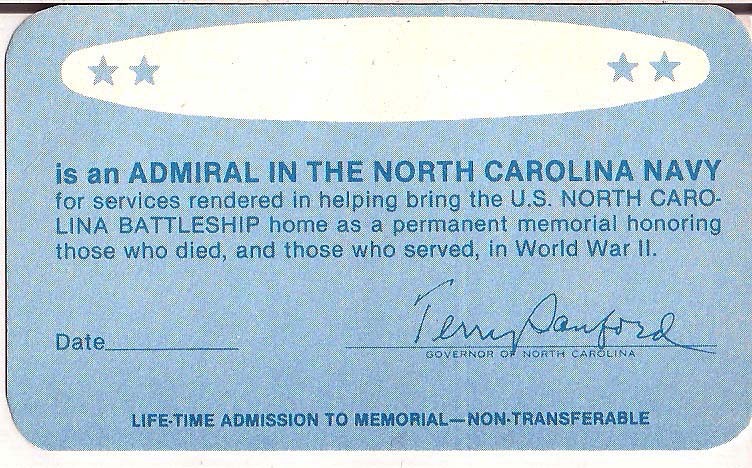 The citizens of North Carolina decided that the ship should be saved because it would make a wonderful memorial to honor the North Carolinians who died in service during World War II. Towing the ship from Bayonne, New Jersey, to Wilmington, purchasing land in Wilmington, and creating the Memorial required substantial funds. Encouraged by the Battleship Committee which found saving the Ship to be both desirable and possible, Governor Terry Sanford appointed a Battleship Commission to raise funds. He selected Post 10 member and prominent entrepreneur Hugh Morton as the chairman. 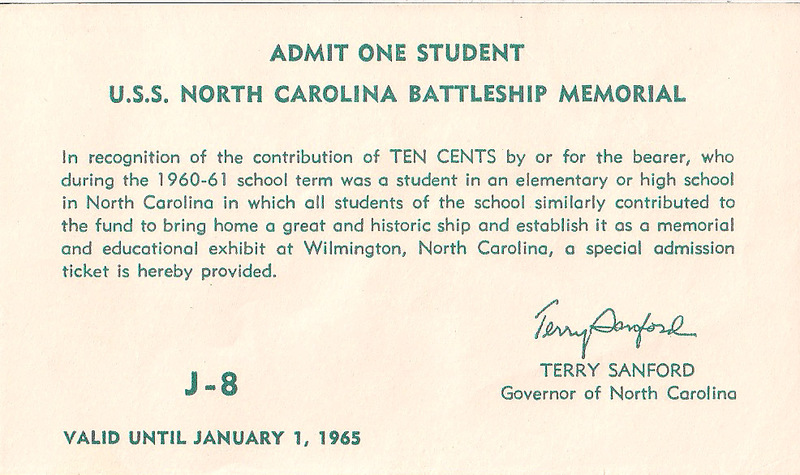 The campaign included asking the state’s students to give 10 cents to save the Ship. If the school had 100 percent participation, then each student received a free admission ticket and the school’s name would appear on a plaque on board Ship. Money poured in from every school in the state. In the end 700,000 of North Carolina’s one million students contributed. The statewide campaign successfully raised $330,000 to purchase, dredge and prepare a site and have the Ship towed from New Jersey. On September 6, 1961, during a formal ceremony in Bayonne, New Jersey, the Federal Government formally handed over the 35,000 ton Battleship to the State of North Carolina. She opened to the public on October 14, 1961. Today this authentically restored Battleship preserves our proud naval history and serves as her state’s World War II memorial to the more than 10,000 North Carolinians who sacrificed their all for their country. To view those who have served so valiantly in the Greatest Generation, visit the official Battleship NORTH CAROLINA Roll Of Honor page by clicking here. North Carolinians enlisted in all the services by the thousands. When the war ended in 1945, 11,081 Tar Heels had died for their country. Search the database by county or by individual name.